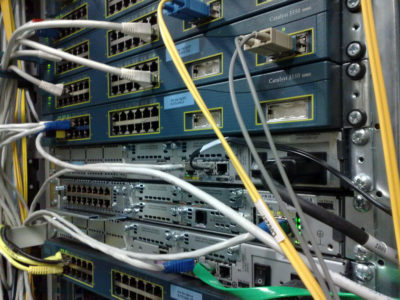 Network recycling consists of recycling your decommissioned gateways, routers, network bridges, modems, wireless access points, networking cables, line drivers, switches, hubs and repeaters. All these electronic networking devices will eventually need to be replaced by newer developing technologies over time. When that becomes a factor, where are you going to dispose of those electronics? We hope you don’t ever just throw them in the trash to head to the landfills. We urge everyone to discard them through an electronics recycling center. At California Electronics Recycler we guarantee that we will either re-purpose or discard of your electronics so that they wont end up in the landfills or overseas. We have a downstream of vendors who are R2 Certified and take the extra steps to make sure the materials get recycled and re-used. All electronics contain materials and metals that can be broken down to scraps and recycled to create new products. Some materials in the electronics are also harmful if not properly disposed of correctly. Some of these materials include Lead, Lithium, Mercury, Cadmium, Barium, Fire Retardants, Americium along with several others. These materials can cause cancer, be poisonous, cause genetic damage, breathing problems, and much more. It is important for these elements to be disposed of properly and responsibly so that others are not affected by them through contact. It is important that electronics are also not incinerated. Overseas and in third-world countries, there are many businesses that use burning or fire to destroy and break down electronics. This creates a large problem when these materials are burned because they produce poisonous gases that will cause health problems to those that are near. Why should you recycle your decommissioned network equipment? Even though you have upgraded your network equipment there is a great possibility that your old equipment can be re-purposed and re-used. When you recycle old network equipment you also keep it out of our landfills where only decomposing materials should be found. It could take a very long time for electronics to break down and decompose and can become a threat if certain elements are not disposed of properly. Through recycling, those materials can be scrapped and used in new recycled products and the hazardous materials can be disposed correctly. Recycling reduces the costs for mining and extracting more precious resources.